Today Greg took me to breakfast at the little diner at the end of his street called Gary’s Handy Lunch. Gary’s is a cute little 50’s style diner/greasy spoon type of place. The food came out quick, and was good. I had an omelette from the special board (sausage, mozzarella, onion tomato) and potatoes. Usually I’m not a huge fan of potatoes, but these were really scrumptious. It is cash only, so prepare for that (yeah, yeah, I should really carry cash). I left Greg’s place around 1:00 p.m., headed in my rental to Portland, ME. The drive started off OK, but as soon as I crossed into Massachusetts it was like I entered a whole new weather pattern. It started pouring so hard, I could barely see and all of the cars were going about 20 under the limit. As soon as I crossed into New Hampshire, it stopped raining for a minute. 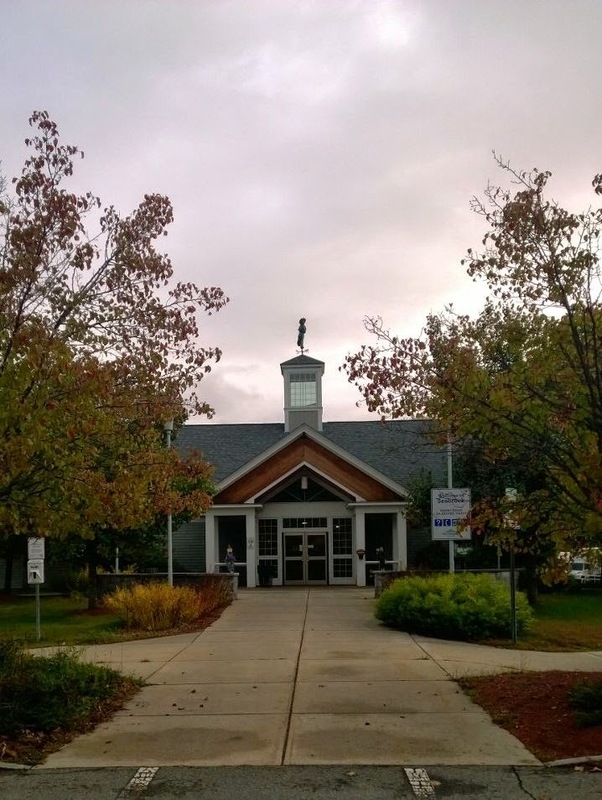 I stopped at the NH welcome center. For one, I totally had to use the restroom (they were clean enough) and two, I had to stop and answer a few work emails (yeah, I was technically taking a few days off, but duty calls). The Visitor’s Center didn’t have wifi, but I just set up my laptop on a table there and used my MiFi. No one seemed to think this was weird and I just went about my business for about 20 minutes. Then it was back on the road. I decided to leave I-95 for 1A. First, there were no tolls and second, I wanted to drive through random towns and maybe stop at random clam shacks, antique shops or what not. It was only an extra 30 minutes out of my way, too. Well, in theory this was a good idea. But then the rain started again, and it was pouring. I ended up just driving up US1 straight through to Kennebunkport. I was right, it was a nice drive through the cute little coastal towns and the leaves were pretty. I just didn’t stop anywhere. Finally, I arrived to Kennebunkport. My original plan was to visit two places. The first place, The Clam Shack, literally closed for the season one day before my arrival. 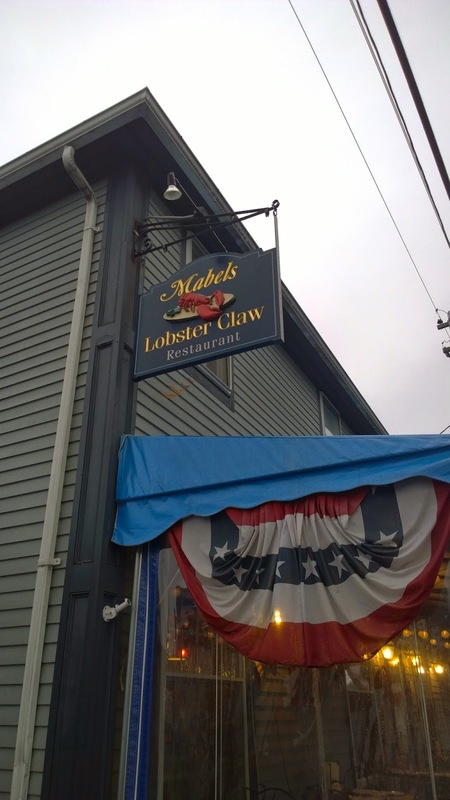 So, it was on to the next – Mabel’s Lobster Claw. While Mabel’s has a full menu and bar (and quite the wine list) I had to get the famous Lobster Roll. I’ve been talking about lobster rolls to my friends, and not everyone knows what they are (guess they aren’t really a thing on the west coast). 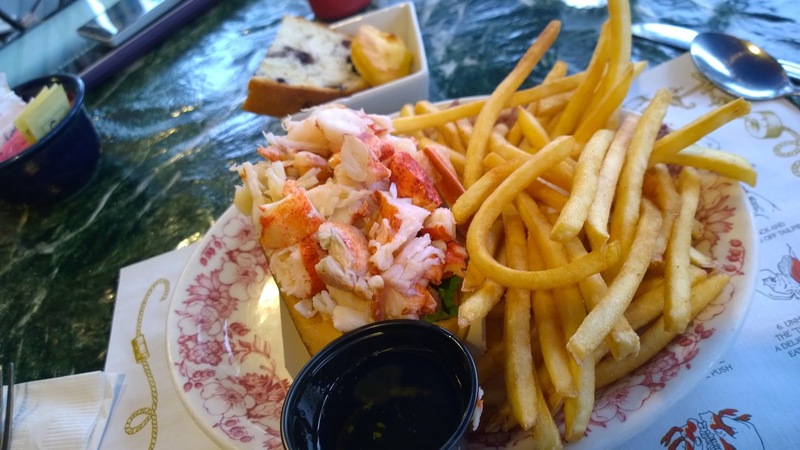 Essentially, it’s bread (piece of bread or a hot dog type bun) toasted on each side, and lots of lobster on top. It depends where you go, but I think traditionally the lobster is soaked in butter but I saw a lot of places serve it with mayonnaise, too. 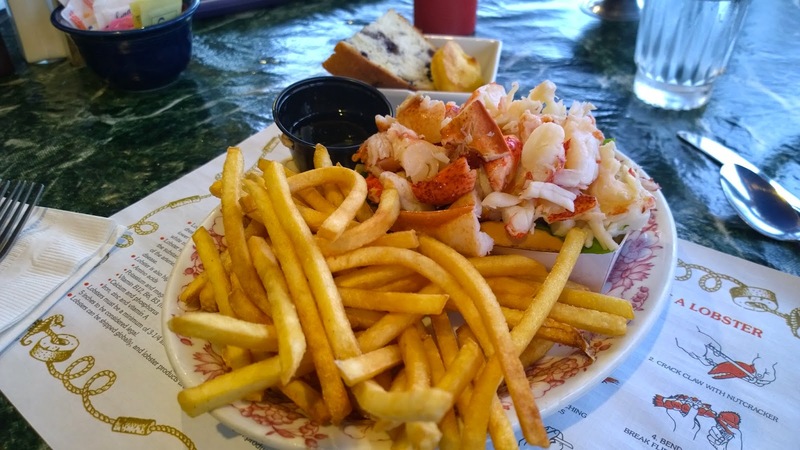 Mabel’s version was bread (like white bread) toasted on both sides, a lettuce leaf and lobster with a side of warm butter. It was served with fries and coleslaw, but since I’m anti mayo, I 86ed the slaw. There was also a lot of lobster in their roll. It was absolutely delicious and a perfect first meal in Maine. After leaving Mabel’s I decided to walk around Kennebunkport (in the rain) and also drive along Ocean Drive to see the houses and the coast. The sky was looking pretty ominous and the waves were crashing up a bit higher than they probably usually do. About 30 minutes later, I found myself in Portland. I checked into the Courtyard Marriott Portland Waterfront. 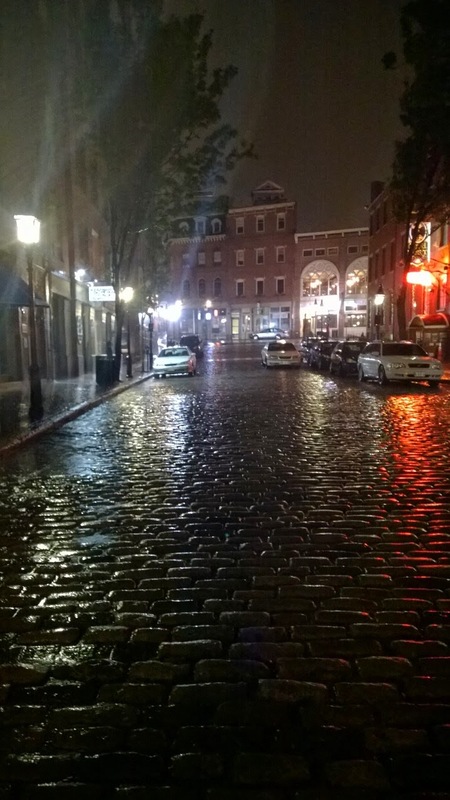 It was just on the edge of the Old Port and perfect for walking around Portland. My king room was actually quite large and it was the newer room design, meaning this hotel is either new or recently renovated. Also, plus to this hotel, the bar had over 20 local beers (though I did not visit the bar). My only complaint about this particular property was that housekeeping would knock on my door, even with the do not disturb sign on the door. After settling in, I showered and got ready to go out. Considering that it started raining again and it was like 47 degrees, I was pretty thankful that I brought my waterproof Cole Haan boots and my raincoat – however, it turned out that even with my fancy gear, I was pretty defenseless against the oncoming Nor’easter. I decided to go to Fore Street for dinner, based on the recommendation of my aunt and uncle. I walked in and the bar is to the left and the dining room to the right. I choose to sit at the bar (always easier to do when you’re dining alone). There was a good list of scotch and whiskey, and I decided since this was my birthday eve fancy dinner, I’d partake in a Bowmore 12. 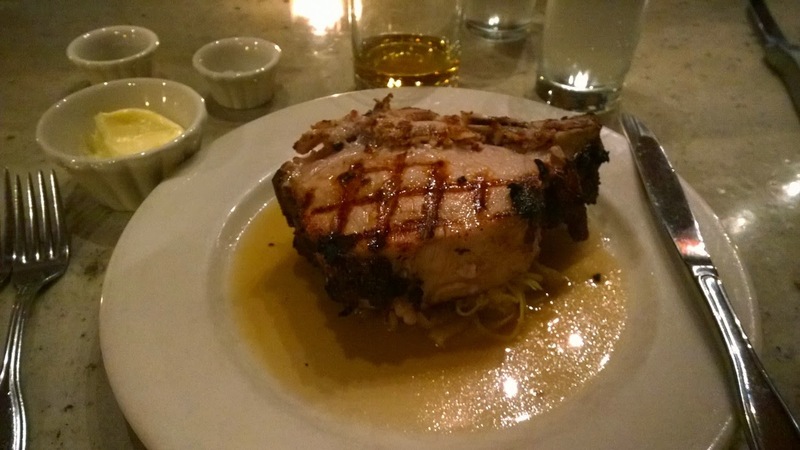 The menu was extensive and Bill, the bartender, suggested the pork loin as it’s pretty much their signature dish. Usually I am not one to order pork, but he totally talked me into it. I also ordered the leek and apple soup. While my food pictures can not do this meal justice, I was pretty happy with my choices. 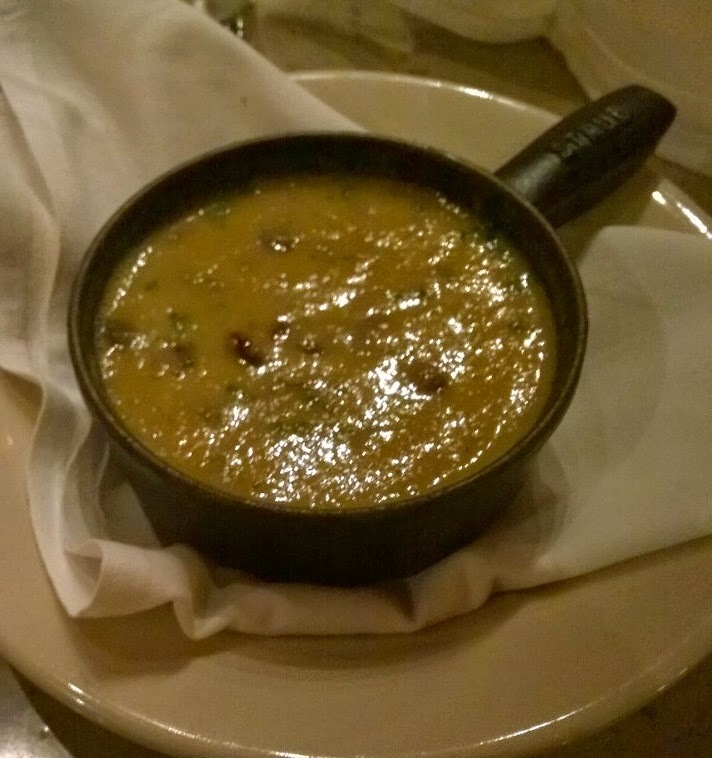 The soup was exquisite. I love soups of all sorts, but especially when they are apple/carrot/parsnip/leek, etc. based. Also, the pork loin was huge and absolutely delicious. It was served over sauerkraut that may have been in apple cider vinegar? Of course, as I was ready to leave it started pouring – really pouring and I was about 3/4 mile away from my hotel. I decided to just deal with it and take a hot shower when I got back. However, about halfway back it really started raining and it was windy. I decided to step inside a pub that was near me just for a little break. Commercial Street Pub is amazing. It’s totally a dive-y bar, with pool tables, digital jukeboxes, locals and office chairs (with wheels!) as bar stools. I loved it. It’s funny, because Greg suggested this place as he knew I’d love it, and it was random that I ended up randomly popping in. So, yeah, I loved this place. 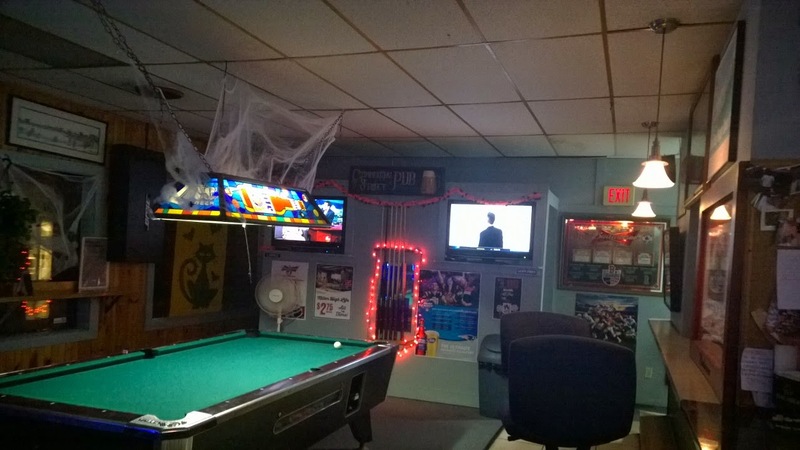 The staff was great – gave me a lemon jello shot – and they had a good beer selection, too. And it wasn’t very expensive and the bar was super unpretentious. Finally it was shortly after midnight and time for me to head home – I had a big day of birthday stuff and needed my sleep. The rain let up briefly and I made my exit and headed home (but first, a picture of a random road on the walk back to the hotel). I think this is my favorite post in the series so far. Reminded me of when I went to Cambridge (England) and got stuck in the rain in the middle of the night and stopped into a pub for a break. One of the best times I've had.